It’s been a week since we published our website infrastructure survey (covering TechCrunch, FeedBurner, iStockPhoto, YouSendIt, Meebo, Vimeo and Alexaholic). The survey has been in the news over at WebProNews, InfoWorld, Internetworld (Swedish IDG), PHP Magazine, as well as a very large number of blogs (CenterNetworks, Ensight, CrunchNotes, TheOpenForce, just to name a few). We’re happy that so many people found the material as interesting as we did when we first came up with the idea for this survey. 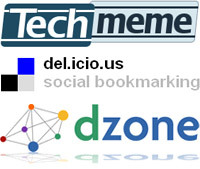 Thanks to all the buzz the article showed up on the front page of Techmeme, Del.icio.us, Y Combinator, dzone and several other social media news sites. Personally I think it’d be fantastically interesting to see how other blog media companies structure their server infrastructure. Not just blog networks, but companies like 9rules and such as well. Not to say “oh we’re better” (I’m an old school enterprise IT guy, so our server infrastructure is almost overkill), but just because we all face such similar challenges and looking at how everyone solves those challenges would probably mean everyone would learn a bit. Not everyone agreed with the way we had made the survey. Kevin Burton made an observation in his Feed Blog. They made one major mistake though. Why in the world would you interview any site that has less than ten servers? They’ve clearly never had to deal with any scaling issues. Adding more memory to a box doesn’t count. While we see his point, this survey (and resulting article) was not meant to be exclusively about scaling issues. The point was to have a variety of popular websites (in some of the cases the word Web app might be more suitable, such as with Meebo) and see what they were running on. There are a lot of curious minds out there (including ours), and we wanted to cover most kinds of websites, not just the ones with lots of servers. There have also been some comments about the small number of websites (“only seven”) and that this would not give statistically correct information. The response to this is that we were not trying to give some kind of definite statistics for the entire Internet. That would require a completely different approach with a much larger sample base (and we certainly would never have been able to interview the companies, either). Instead, think of this survey as seven snapshots of highly popular websites, something that could give insight and provide inspiration to others. That said, we still felt it was both interesting and relevant to see what they had in common. If you are interested in keeping up with what others are doing in web development, this is a good article. Which is exactly what we were aiming for.